Like most top independent, nonprofit, American schools, Graded relies upon philanthropic contributions to fulfill its mission. Tuition alone does not cover the entire cost of a child's education at Graded. We aim for 100% community participation and ask that you contribute to the Graded Annual Fund at a level that is meaningful to you. We rely upon the Graded Annual Fund to bolster our operating budget and enrich educational and extracurricular programming, attract and retain top-notch educators, enhance facilities, and help fund scholarships. All donations - large or small - matter. An annual fund is an institution’s measure of community satisfaction, and strong participation inspires major donors. In anticipation of its 100 year anniversary, Graded launched the Centennial Campaign in support of the following three priority initiatives. Tuition does not cover these endeavors, and donor dollars are necessary to drive these projects. Graded Campus Project - A multi-phase project of construction, modernization, and renewal that is transforming the Graded campus by investing in infrastructure and the school’s future. Excellence in Teaching Endowment - This endowed fund ensures that Graded is able to recruit, retain, and develop the world’s best teachers for many years to come. 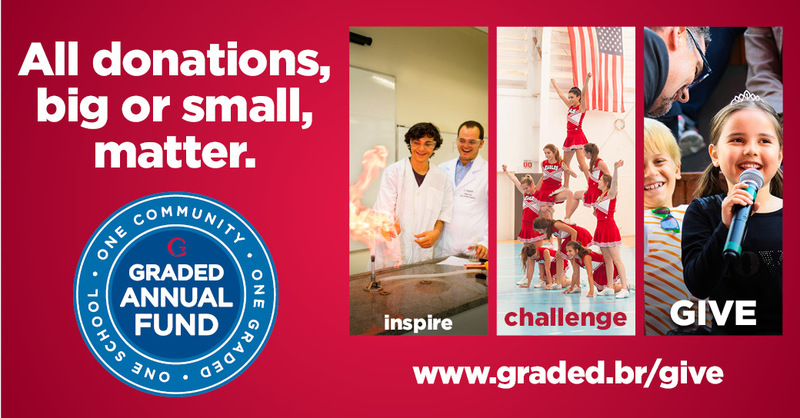 CLICK HERE to learn more about Graded’s Centennial Campaign. What is a Leadership Donor, and how do I become one? Leadership Donors are those community members who pledge a minimum of R$100,000 to Graded’s Centennial Campaign. Donors may direct their contributions to one of the school’s three strategic initiatives and fulfill their pledges in up to three years. Leadership Donors are recognized on the Student Center’s Donor Pillar and in the Annual Report. Additionally, they are invited to recognition events throughout the year. To keep up with inflation, the entry-level Leadership Donor pledge will increase to R$150,000 next semester. However, the Leadership Donor Circle minimum contribution will remain R$100,000 throughout this calendar year. To learn more about the Centennial Campaign, please contact me at susan.clain@graded.br or +55 11 3747-4800 ext. 139. How can I make a contribution to Graded? You can give via PayPal, wire transfer, check, or cash. CLICK HERE for instructions and payment links. I am a U.S. taxpayer. Can I make a tax-deductible gift to Graded?